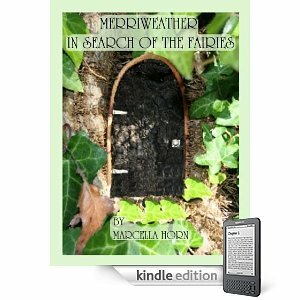 Well, I finally got Merriweather in Search of the Fairies (my MIL's fairy tale adventure for kids) uploaded to Amazon's CreateSpace. It's been a huge learning experience and I'm lucky to have a super-duper computer tech on hand who has tons of software program experience or I'm sure I'd have a different story to tell. All in all, it's been one thing after another. My biggest problem was getting the illustrations where I wanted them and finalizing the format so it all looks pretty AND THEN converting it to print-ready PDF format. Anyway, the ball is in Amazon's court, at least for now. So...there I was figuring I should update the Kindle version of the book. Eventually, I hope to get it uploaded for Kindle with the illustrations but I think that's going to be a BIG job. Seems I remember something about zip files and who knows what all else - basically, it goes over my head. But I did make a few changes to the manuscript when preparing it for print and also caught some errors (like corn stock instead of stalk) so I wanted to update the Kindle file. Word file comparison to the rescue! Well...my computer software expert guy had told me that Word has a cool comparison feature so I thought I'd give it a try. And yes, it is VERY cool! I just clicked on 'Compare' and selected the files for the Kindle and hardcopy versions, chose for it to show me the changes in a new document, and hit the go button. All was going well. It was showing the differences beautifully and I was making changes to the original Kindle version. Then, all of a sudden, what did I find? Merriweather with just one 'r'! Are you kidding me? How did that slip through? And yes, it's in the hardcopy version that way, as well. That's right, the hardcopy version that has already been submitted to CreateSpace for review. Now I'm not sure what to do. Obviously this is NOT an error that will go to print. After the file is reviewed on Amazon's end, I then have to do a final proof on the book. What I'm not sure about is whether I can make this extremely minor change (we're talking about adding just one 'r' here) without going through the whole upload and file review process again. Hmm. Well, I guess I'll find out soon enough. The file review is supposed to take 24-48 hours so it could be done as early as tomorrow morning. I guess the good news is that even if I have to re-upload the file and wait for the review again, it only sets us back a day or two. Congrats on getting so much done with the book. It is a lot of work. Yes, you'll have to upload a new file in CreatSpace to replace the one with the errors. As far as I know, you can't change a spelling error in the proof. But at least you found out BEFORE you hit publish. That way you can upload the new file before anyone sees it. Thanks, Deanna - that's what I thought. The exciting news today is that our proof copies already got here! How did they do it so fast? I ordered them last Tuesday morning and had an email that evening that they'd shipped. Then I picked them up at the PO today, which is just one week later. BUT the PO guy told me they'd actually come in on Saturday - WOW! Amazon CreateSpace is just amazing! Are You Ever Too Old for Confidence and Hope? Are You Putting Off Living?